As I explore Women's History Month with students, I want to help them think about how they can honor women in history. We talk about honoring women in their lives, because for young students the immediate it so important. But I'm also fascinated by the way authors investigate women whose stories we might not have heard yet. Today, I'm thrilled to share with you an interview with Tracey Fern about her journey to learn about the life of Eleanor Prentiss and then writing Dare the Wind. My questions are in red; Tracey's answers follow in black. MS: How did you first learn about Eleanor? What drew you to her story? TF: I first learned about Eleanor when I was browsing through my local bookstore and happened upon David Shaw's book, Flying Cloud. I'm always on the lookout for strong female characters, and so I knew instantly that I wanted to write about Eleanor. Eleanor's story also combined adventure and science, two elements that I'm also often drawn toward. Finally, I'm a Massachusetts gal who grew up with the ocean and the beach in my backyard, and I love that Eleanor grew up here, too! MS: Did you travel at all to do your research? What was your research process like? TF: I traveled to Marblehead, Massachusetts while writing Dare the Wind. Marblehead was Eleanor's home town, and parts of the town still look much the way I imagine they looked when Eleanor walked its cobbled streets. I also visited the Mystic Seaport Museum in Connecticut and toured the USS Constitution in Boston harbor to get myself in a seafaring state of mind! My research process for this book was different from my usual research, because there are relatively few primary sources available. As a result, I relied more heavily on secondary sources than I typically do. 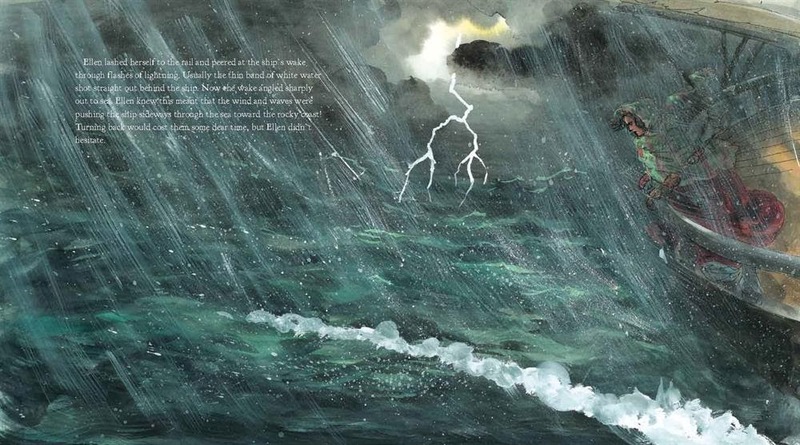 MS: I was amazed at how well you conveyed being on a ship at sea in a storm. Have you sailed like this at all? TF: Thank you! I've been sailing before but never under the challenging conditions that Eleanor faced. 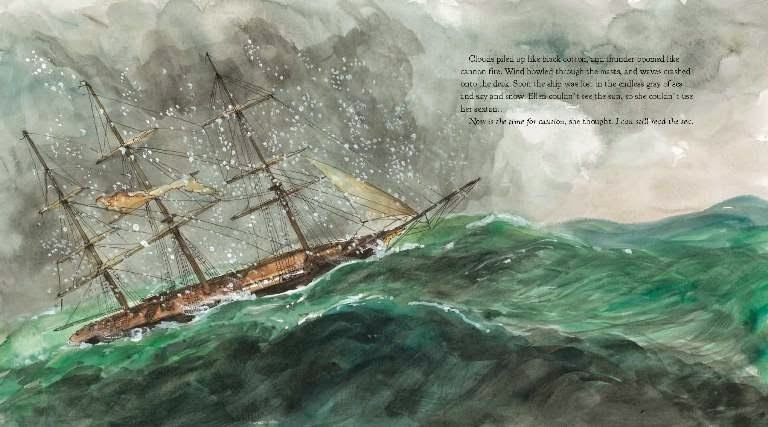 I'm so happy that I could convey the sensations of being on a ship at sea in a storm to readers. MS: Did you provide any guidance to Emily McCully to help her make sure the illustrations were historically accurate? 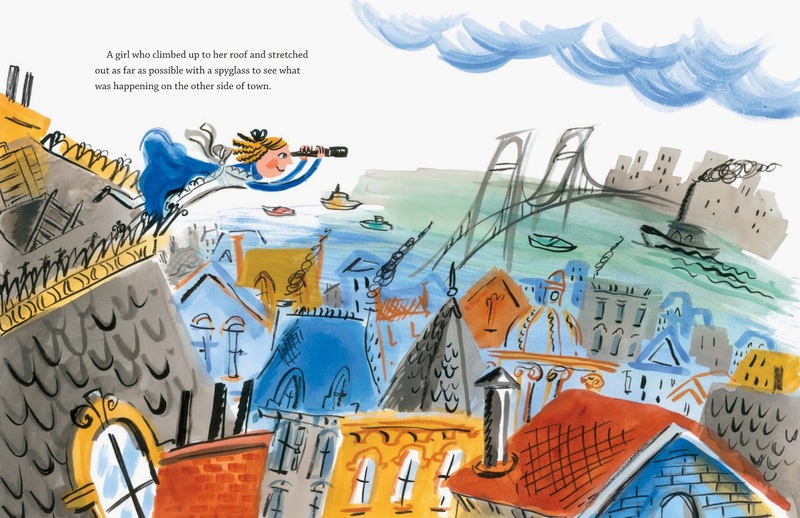 What details do you want children to notice in the illustrations? TF: I adore Emily's illustrations! She did her own research to ensure that her illustrations were accurate. I did send Emily a very detailed description of the Flying Cloud that was published at the time of the ship's launch. 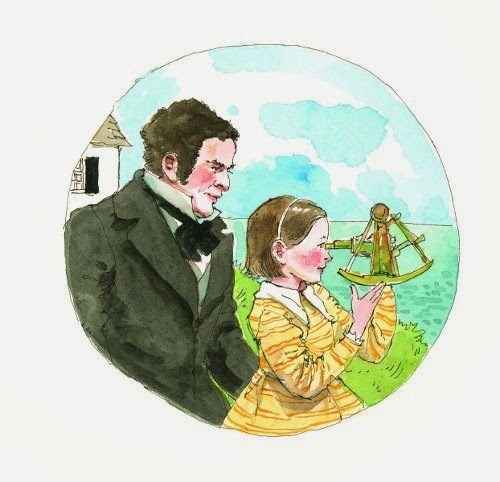 Some of the details that I love in Emily's illustrations are the wonderful spread of the Flying Cloud at the pier in New York City, the view of Ellen (Eleanor) below deck working on her charts which beautifully captures the feeling of motion in the tilt of the lamp above her head, and the cover illustration which shows the figurehead of an angel on the prow of the ship, mirroring Ellen and her telescope on deck. I especially love the cover illustration because it seems to capture the forward movement of Ellen's amazing journey! MS: What was the most surprising thing you learned about Eleanor doing your research? TF: The most surprising thing about Eleanor was just how ahead of her time she was. Not only did she assumed the role of navigator at a time when that was absolutely atypical for a woman, she also embraced the new navigational theories of Matthew Fontaine Maury, which went against the prevailing wisdom of the time. Eleanor was clearly a force to be reckoned with! MS: Did you have to leave anything out that you really wanted to include? TF: There's always so much more I'd love to include in all of my books! Believe it or not, Eleanor's journey was filled with even more exciting incidents, including a threatened mutiny that I simply couldn't include. I would have also loved to have included more details about Donald McKay, the builder of the Flying Cloud, and the ship-building process, but perhaps that's material for another book! Thanks so much for your interest in Dare the Wind! Thank you, Tracey! I loved sharing this story with students, and hearing their reactions. Eleanor was definitely a force to be reckoned with! For more information, definitely check out Tracey's website. Illustration copyright © 2013 by Emily Arnold McCully, shared by permission from the publisher. The review copy was kindly sent by the publishers, Margaret Ferguson Books, Farrar Straus Giroux, an imprint of Macmillan Books. If you make a purchase using the Amazon links on this site, a small portion goes to Great Kid Books (at no cost to you!). Thank you for your support. Women's History Month inspires kids in so many different ways. Here are two modern women that our kids look up to: author Jennifer Holm, and soccer star Alex Morgan. Each of these women gives the message to all our kids: you can follow your dreams and become whoever you want to be. 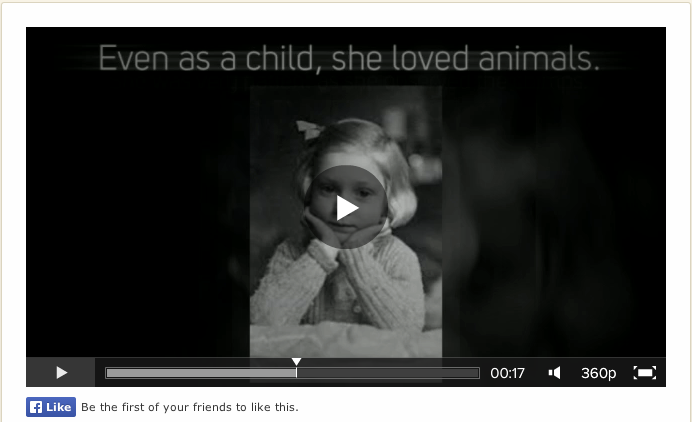 Emily had a lot of fun making an Animoto about her favorite author Jennifer Holm. Many of our students love Holm's Babymouse series (did you know Happy Birthday, Babymouse comes out in 3 weeks?! ), but Emily also gives a shout-out for Turtle in Paradise, Holm's novel set in 1930s Key West. 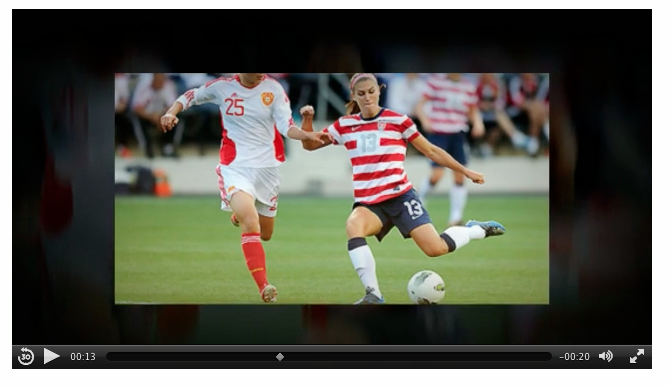 Madeline honors Alex Morgan, an American soccer player and Olympic gold medalist. Madeline was so excited to try out using Animoto -- and I'm really excited to learn about a new sport hero our girls admire. U.S. women’s soccer team player and Olympic medalist Morgan’s enthusiasm for the game is evident throughout this light and lively contemporary read. 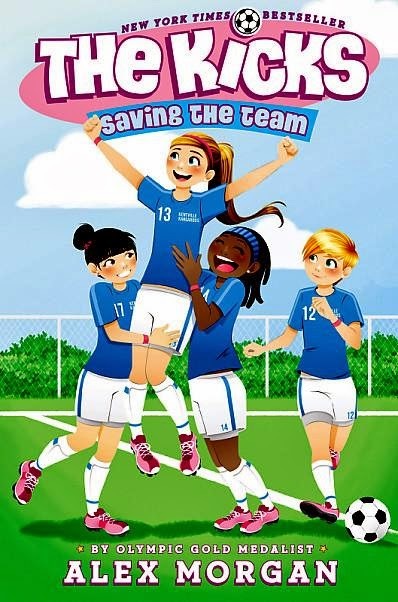 Though there are some predictable story elements, Devin is an appealing protagonist whose peppy first-person narrative incorporates abundant soccer details, along with familiar themes of making friends and the value of teamwork. Stay tuned for my Animoto showing all the great posters that students have made. Thanks very much for celebrating Women's History Month with Emerson students! If you make a purchase using the Amazon links on this site, a small portion goes to Great Kid Books (at no cost to you!). Thank you for your support. I've always been amazed at the journeys gold prospectors underwent to travel to California in the 1840s and 1850s. Can you imagine taking a covered wagon across the Rockies or a clipper ship around Cape Horn? 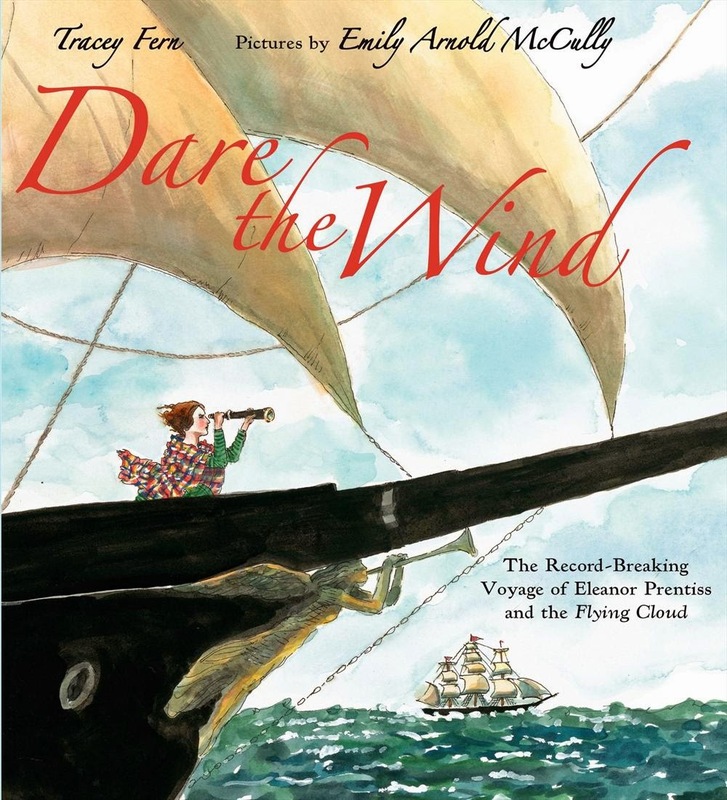 If these voyages fascinate you, I highly recommend Tracy Fern's new picture book, a biography of Eleanor "Ellen" Prentiss, who navigated the fastest clipper ship to sail from New York to San Francisco. Ellen Prentiss loved the sea her whole life, but she was no ordinary little girl. Her father taught her how to sail his trading schooner and use complicated navigating tools like a sextant, and soon she was sailing her own ship, racing the fishing fleet across Massachusetts Bay. Ellen married Perkins Creesy, a ship's captain, and soon they were sailing together, with Ellen navigating their ship. When Perkins was given command of The Flying Cloud, a fast new clipper ship built to take passengers and cargo from New York to the California Gold Rush, Ellen knew it was up to her to help find the fastest winds and swiftest route. "She plotted a course to catch the strongest wind and current she could." Tracey Fern builds this dramatic story, carefully helping children understand the difficulties Ellen, Prentiss and the crew faced. My students gasped when The Flying Cloud's mast broke, and you could see the worry on their faces as Ellen faced stormy weather around Cape Horn. "Now is the time for caution, she thought. I can still read the sea." "A true navigator must have the caution to read the sea, as well as the courage to dare the wind." There are many excellent resources for children who are interested in this story. Check out the new LiveBinder page put together by the Junior Library Guild: Booktalks To Go. I also love the way that Tracey Fern has included some of her favorite links on her website. Illustration copyright © 2013 by Emily Arnold McCully, shared by permission from the publisher. The review copy was kindly sent by the publishers, Margaret Ferguson Books, Farrar Straus Giroux, an imprint of Macmillan Books. If you make a purchase using the Amazon links on this site, a small portion goes to Great Kid Books (at no cost to you!). Thank you for your support. Here are two more great projects celebrating women that our students admire -- both have strong roots in the Bay Area as well as national garden movement. Bella honors Alice Waters, chef and activist. Our students at Emerson have loved having a school garden, a project that Waters has been particularly instrumental in spreading throughout the Berkeley schools. Did you notice how Bella included her photo credits on the last slide? This made my librarian heart smile -- here's a student really incorporating Digital Citizenship lessons. Hooray! These are the first digital projects that these students have done. I love how they've ventured into this new way of presenting information. If you have a chance, they would love to hear what you think about their projects. Leave a comment below if you can! Emerson students have been so excited to share their projects on amazing women. 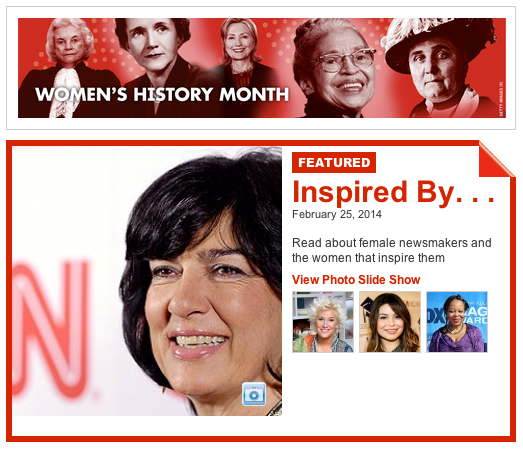 I just love the way they're celebrating women who inspire them. Over the next week, I'd like to share several projects. -- click through to watch it. Mykeia created a Google Presentation about Fantasia Bronno, an amazing winner of American Idol. One of the things I've loved about this project is how excited the kids are to find out about these women and share their information in new and interesting ways. Because it isn't a required project, it's more fun to do! And, they've learned great presentation skills, while having fun. Do you remember when you were a little kid and looked into the cockpit of an airplane? Wowwwww... all those controls and buttons and dials. 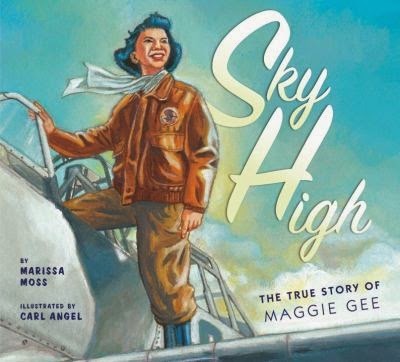 I love sharing the story of early women pilots, and one of my favorites is Sky High: The True Story of Maggie Gee. Pair this with a great video interview of Maggie, which I'll include below. As a young girl, Maggie Gee longed to fly, but it wasn’t until World War II broke out that she was able to achieve this dream. 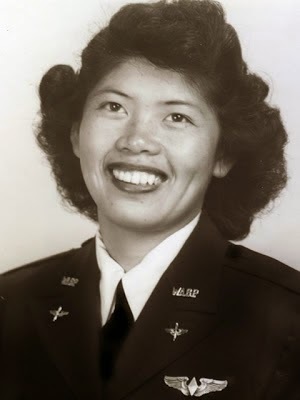 One of only two Chinese-American women to join the Women Airforce Service Pilots (WASP), Maggie’s passion for flying shines through in this biography of a true local hero. Gee went to UC Berkeley and was a longtime resident of Berkeley after her days in the WASP. Older students might want to use this as a launching pad for talking with neighbors, family members and friends about their experiences when they were younger. I found this article about Maggie Gee in Bay Area Insider also very interesting. The review copy came from our school library. If you make a purchase using the Amazon links on this site, a small portion goes to Great Kid Books (at no cost to you!). Thank you for your support. Do we help our girls by sharing stories of women who broke through barriers, daring the world to accept them as they wanted to be seen? I definitely think we do. Who knows what our girls will want to do as they explore their passions and confront others' expectations. 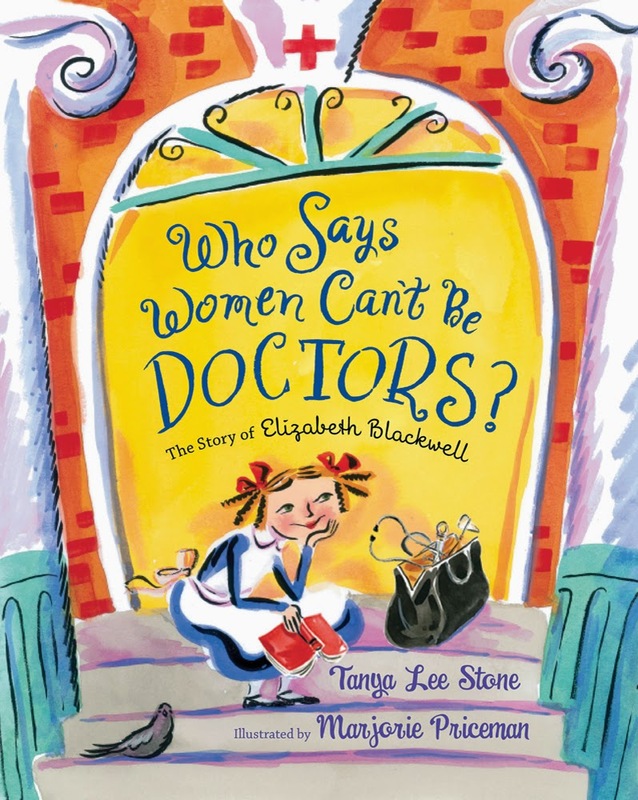 Tanya Lee Stone's upbeat portrait of Elizabeth Blackwell is a delight to share with young girls. "I bet you've met plenty of doctors in your life. And I'll bet lots of them were women. Well, you might find this hard to believe, but there was once a time when girls weren't allowed to become doctors." Stone's challenges young readers: Who do you think changed all that? 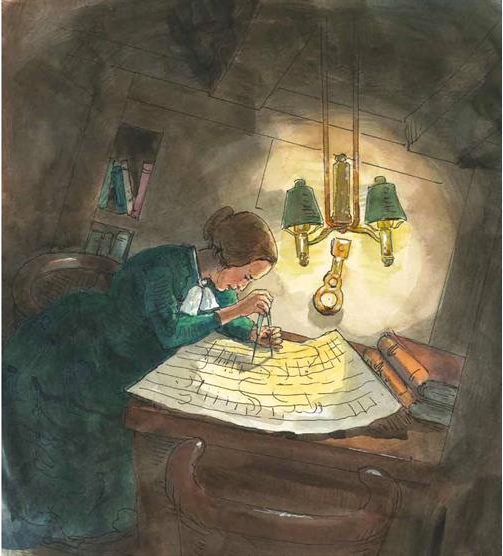 Elizabeth Blackwell loved exploring new things, taking on challenges and doing the best she could. 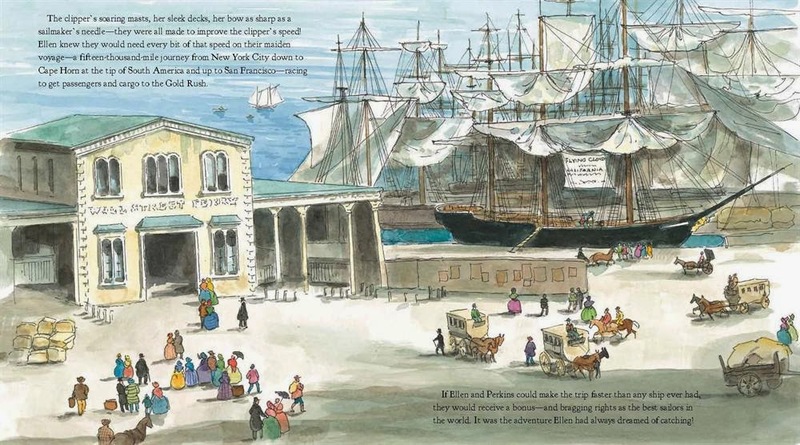 Don't you just love Marjorie Priceman's illustrations? As The Horn Book writes, they lend a perfect framework of energy and pacing to the text." 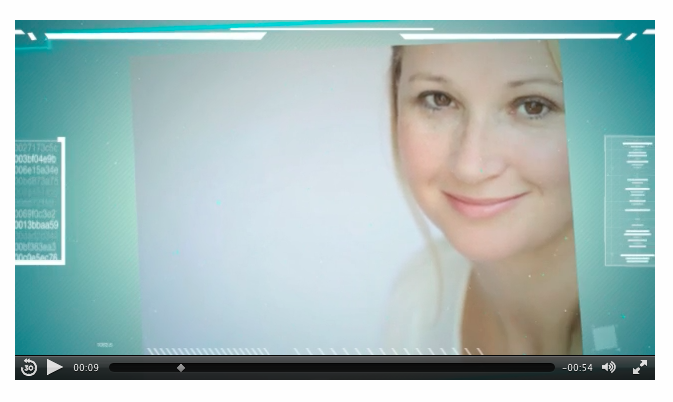 Even though she was rejected from 28 medical schools, Elizabeth kept pursuing her dream. Read this aloud with 1st through 4th graders, talking about what qualities helped Elizabeth persevere. See where you can see her courage, sense of self, and determination. Illustration copyright © 2013 by Marjorie Priceman, Who Says Women Can’t Be Doctors?, written by Tanya Lee Stone. Published by Christy Ottaviano Books/Henry Holt, an imprint of Macmillan Children’s Publishing Group. The review copy came from our school library. If you make a purchase using the Amazon links on this site, a small portion goes to Great Kid Books (at no cost to you!). Thank you for your support. Frida Kahlo's artwork captures my imagination. 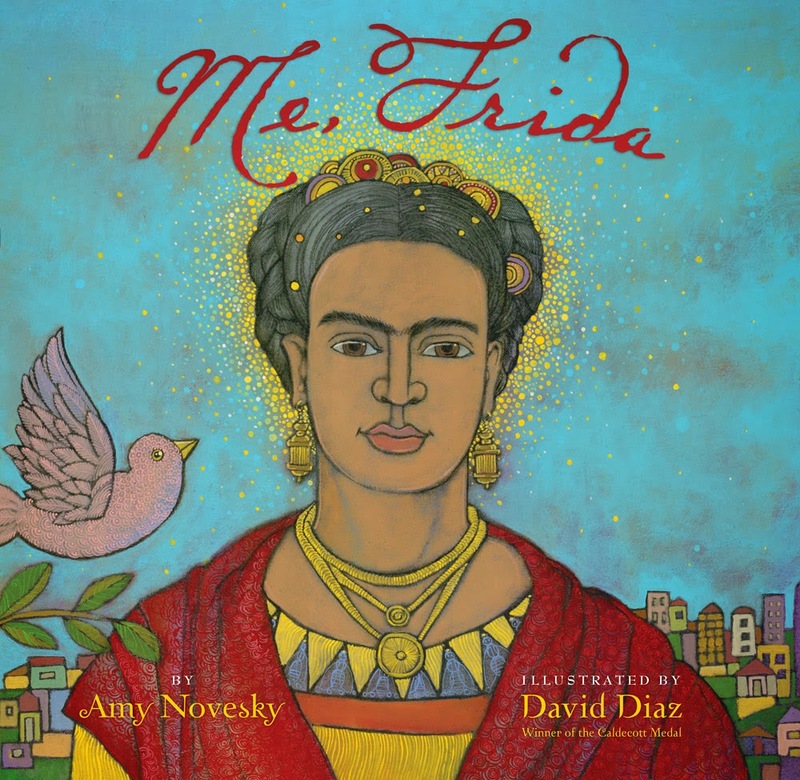 I love introducing her artwork to younger students with the beautiful picture book Me, Frida by Amy Novesky and illustrated by David Diaz. Novesky focuses on how Frida really came into her own, discovering her own voice through her artwork. This lush picture book focuses on Frida Kahlo’s trip to San Francisco with her new husband, Diego Rivera. Frida felt so far away from home in our cool, gray city, but as she started exploring the city on her own and began painting she began to find a place for herself. The spread below shows Frida after she found her voice, painting "something great: a colorful wedding portrait of herself and Diego. She painted Diego big, and she painted herself small, just as the world saw them." 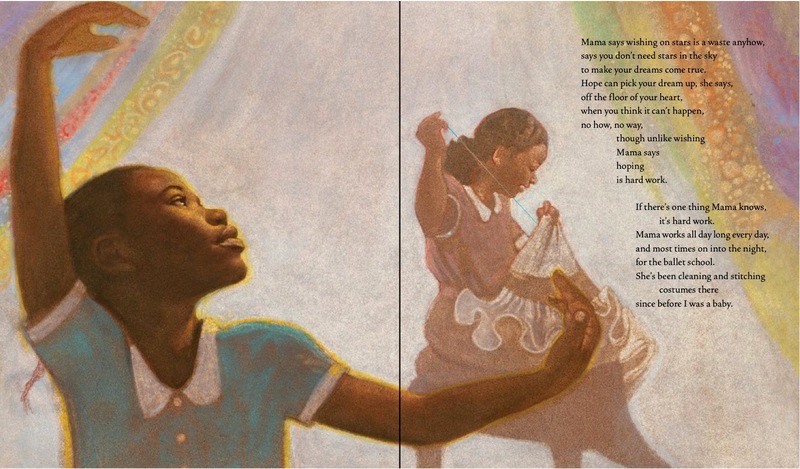 Glowing with vibrant, jewel-tone colors, this book will inspire young readers to learn more about this glorious artist. David Diaz's work is truly stunning. Head over to Amy Novesky's website to see more. For older students, I would direct them to both the PBS website for the film The Life and Times of Frida Kahlo and the SFMOMA website from their exhibition on Frida Kahlo. In the SFMOMA site, check out the interesting multimedia resources for interactive features that kids (ages 9-12) will find interesting. Illustrations copyright 2010, David Diaz, shared with permission of the publishers. The review copy came from our school library. If you make a purchase using the Amazon links on this site, a small portion goes to Great Kid Books (at no cost to you!). Thank you for your support. I know in my heart that we can bore our kids with history or we can engage them, show them them that it matters, that it's wrought with conflict -- and we're still wrestling with many of these same conflicts today. Try showing these two videos, with clips of powerful actresses reading Sojourner Truth's speech, Ain't I a Woman, and see what your kids think. Kerry Washington combines the swagger of today's girls with Sojourner Truth's strong declarations. I like the way this video clip splices together parts of Truth's speech with Washington's reflections on why it's important to learn about history. This video clip has much more of Sojourner Truth's speech, It would be very interesting to have kids watch both of these videos and talk about what each actress brings to their performance. What questions does Truth ask that we could still ask today? What issues are we still wrestling with? 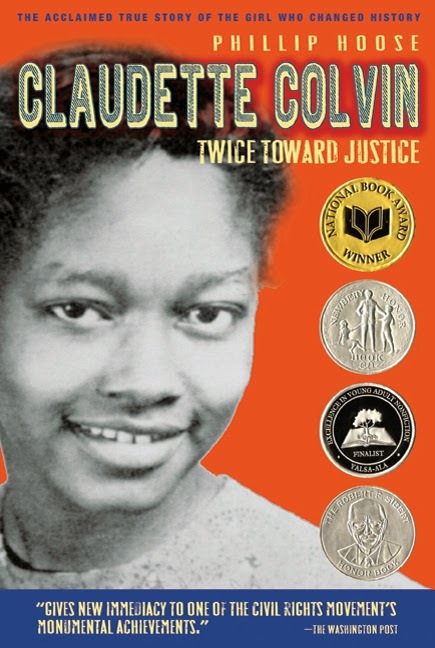 I would follow up this with reading aloud Claudette Colvin: Twice Toward Justice (read my full review here) -- one of my all-time-favorite nonfiction books. Both of these videos came from Anthony Arnove, co-editor, along with Howard Zinn, of Voices of a People's History of the United States. See more at Arnove's You Tube channel. What's it like to hold on to a dream? Can a role model truly encourage a young child, or is that just what parents and teachers tell themselves? There are times that sharing a story helps me keep faith, just as much as reading an inspiring biography. 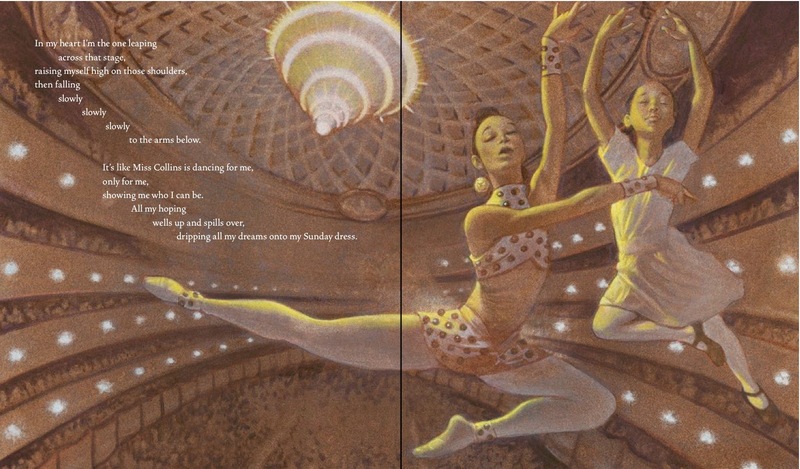 A Dance Like Starlight is a book that filled me with hope and warmth, as I read about one little ballerina's dream. 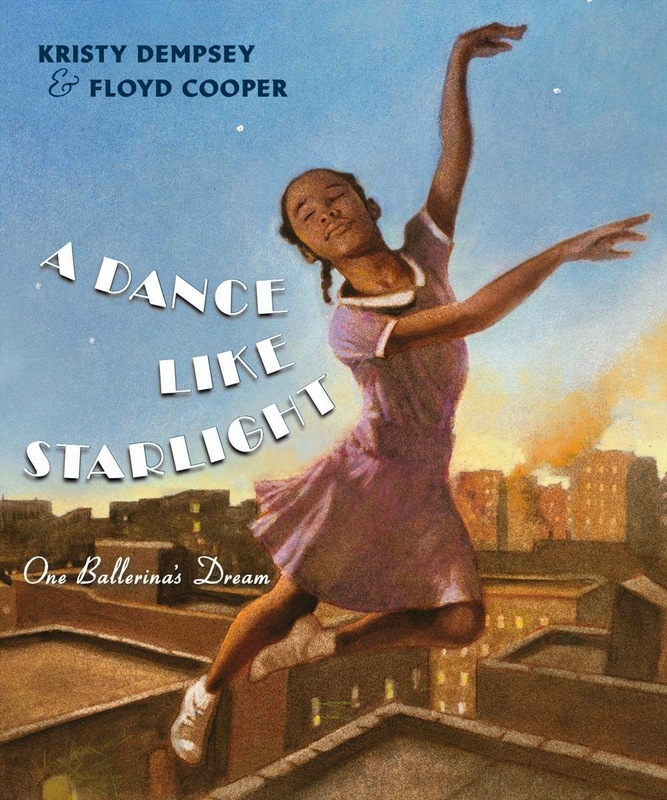 A young African American girl longs to dance with the ballet school, but her mama says "wishing on stars is a waste anyhow." Hope is the key, mama says, but "hoping is hard work." Her mama certainly knows hard work, taking in laundry at night, and working every day sewing and cleaning costumes for the ballet school. When the Ballet Master sees her dancing in the wings, he notices her talent and dreams and invites her to join lessons each day "even though I can't perform onstage with white girls." Demspey and Cooper build up the story slowly and softly, helping readers understand the setting in 1950s New York, the discrimination at play. 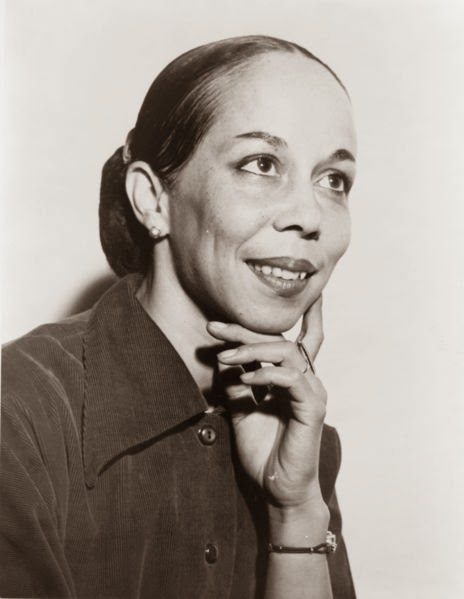 When Mama takes her daughter to see Miss Janet Collins, the first African American prima ballerina to dance with the Metropolitan Opera House Ballet, the little girl's heart soars, "dancing, opening wide with the swell of the music." This story reminds me of the power of role models, the way they can inspire us to reach out for our dreams and persevere through hard times. Floyd Cooper's artwork is uplifting and dreamy, with soft grainy textures. Did you know he creates all his artwork by first painting layers, and then erasing them slowly to reveal the shapes? Share more information about Janet Collins with your children. I loved reading about her in the New York Public Library article and this New York Times article, both celebrating the life of Janet Collins. Thanks very much to Deborah Ford's and Junior Library Guild's Booktalks to Go LiveBinder. If you're looking for more books to read with kids and information to make that reading experience richer, I highly recommend this site. All illustrations are copyright ©Floyd Cooper, 2014, shared with permission of the publisher, Penguin Books for Young Readers. The review copy came from our school library collection. If you make a purchase using the Amazon links on this site, a small portion goes to Great Kid Books (at no cost to you!). Thank you for your support. I read ten or more books each week. They feed my soul. But they also start swimming around in my mind like minnows in a stream. So how do I keep track of the books I've read, remember those I've liked and recommend books to friends? I have used Goodreads for over five years, and I love it. Here's my shelf on books to recommend for Women's History Month, with just five of the books I've recently added. Click through to Goodreads to see more! Share book reviews and ratings with Mary Ann, and even join a book club on Goodreads. When I'm doing a blogging challenge or planning a teaching unit, Goodreads helps me remember books I've read -- kind of like browsing the physical shelves in my library. How do you keep track of the books you've read and those you want to read? Do you like keeping this list to yourself, or do you like sharing it with friends? Today, I'd like to share a guest review by Emily S., age 10, also known as my youngest daughter. This week, she read Love, The App, winner of the 2014 BolognaRagazzi Digital Award for fiction. 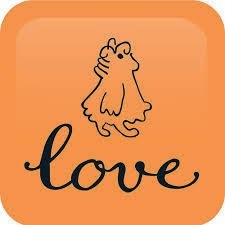 I just read the book app Love and I think that it is amazing. Why I think that because I love how the company that made the app have a lot of interactive features but not too much interactive items that the reader wouldn’t get distracted from the book. This book app is about a girl who gets taken to an orphanage because her parents left and she has no relatives. And when she goes to the orphanage none of the other kids play with her just because she is ugly. But one day the manager of the orphanage almost kicks her out of the orphanage. She didn't have any relatives. I also really like the layout of this book app especially because of the transitions. Why I love the transitions of this book app is because you have to figure out how to turn the page, you don’t just swipe your finger and it turns the the page, you have to tap certain objects or you have to swipe the flaps in. I think that the moral of the story is that even if someone looks different it doesn’t mean that they don’t have a kind heart or that they don’t deserve friends. And that you should always treat people the way you want to be treated. In conclusion I think Love is a great book app because it is a great story,it has interactive features, and it has a great moral too. This book app is great for all ages (even grownups!). Why this book is for all ages is because it is heartfelt, interactive, and it has a great story structure. Thanks, Emily! I really enjoyed hearing your thoughts on this. It's especially interesting how much you enjoyed having to "figure out how to turn the page". I agree that the moral of the story really shines through in this story. The review copy of the app came from our home library. We purchased it after reading about the BolognaRagazzi Digital Awards in the excellent journal Children's Technology Review. Emerson students are having so much fun creating projects to celebrate amazing women this month. Some are researching pop stars, others are celebrating their mothers or teachers. I'm excited to share two digital ways to create projects. 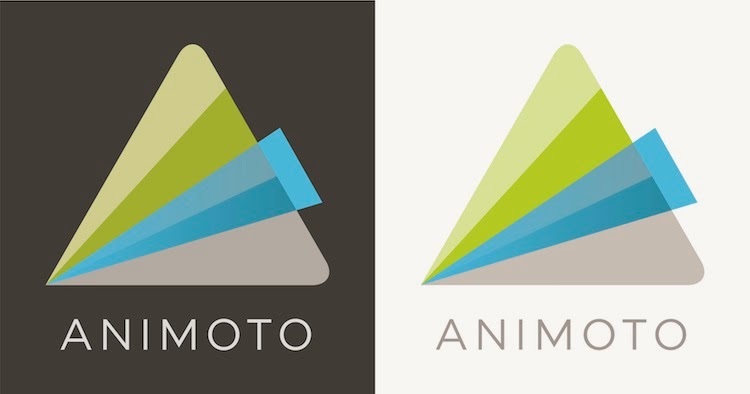 Animoto is an easy-to-use online video creation site that you can use to create short, dynamic slide shows. Kids love the music and movement. I love that you can add just a few words with the images to really communicate your ideas. Plus, it's free (for short videos)! Our 4th and 5th graders are also learning how to use their school Google accounts, and some are taking the challenge to create a Google Presentation. Again, they love using images! For many kids, this is much easier than creating a poster board. Here's an example I created about Jane Goodall. I really tried to show the kids how one simple picture with a short caption can communicate a lot of what you admire about a person. We talk about how this presentation doesn't have much of a conclusion, that I could have put in more of my own ideas. I'm excited to see what projects the students create! Are your students creating anything using new digital tools that they love? There are so many to choose from!! Throughout Women's History Month, I share with students stories of women who inspire me with their determination and courage. When I first read about Wilma Rudolph, Olympic champion sprinter who overcame incredible odds to win victory, I was awe-struck. 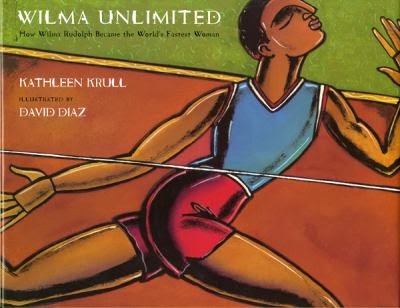 My students sit in rapt attention each time they hear in Kathleen Krull's picture book biography Wilma Unlimited. No one expected Wilma Rudolph to survive her difficult childhood. She not only learned to walk after having scarlet fever and polio, but joined her school’s basketball team and then her college’s track team. Through sheer determination and hard work, she went on to win three Olympic gold medals. My students cheer for Wilma at every turn in this inspiring biography. If your children are inspired to learn more about Rudolph, I'd recommend two websites: Olympic.org and ABC Sports. You'll find historic film footage and photographs on Olympic.org, the official website for the Olympics. I like the way it combines brief facts, compelling images and a short biography that students can read for more information. 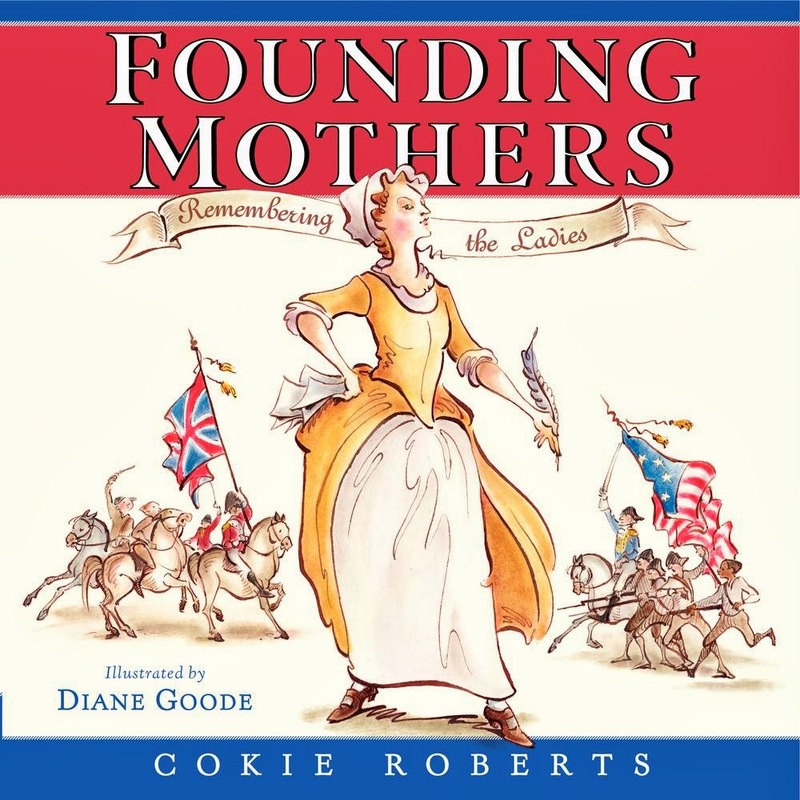 Tonight, I was reading aloud with my 10 year old (yep, she still loves it when I read her picture books) and I told her why I really wanted to read some of Cokie Robert's new book Founding Mothers. I explained that when I was growing up, the history books really didn't have much about the women who helped establish this country. Immediately, she was hooked and wanted to hear more. Roberts begins this picture book with letter explaining to readers how she came to write this book. It's a wonderful way to begin, because it personalizes the story for children, explaining why Roberts felt it was so important to write this and share these women's stories. "I don't remember ever being taught anything about the women who lived at the time the thirteen American colonies decided to break from Britain and build a country. I knew nothing of the mothers, wives, sisters, daughters and female friends of the men who wrote the Declaration of Independence, fought in the revolution, created the Constitution, and formed our first government." Roberts profiles ten women who were influential in the founding of the country, whether directly through their own writing or actions, or indirectly through the men they supported. 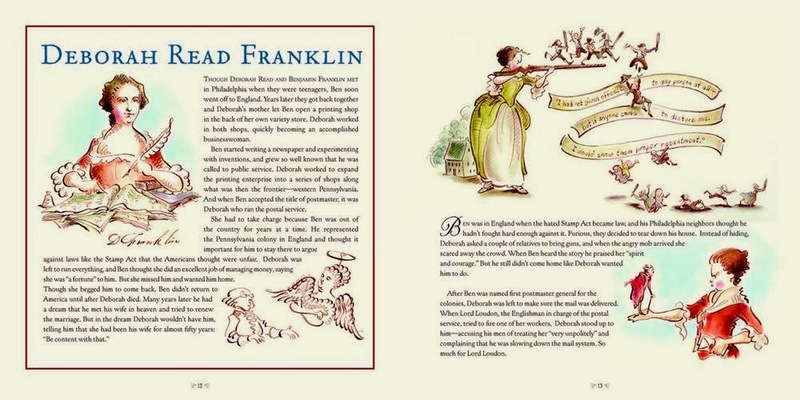 She writes of Deborah Read Franklin, who ran her husband Ben Franklin's businesses in the States while he was in England. Goode's illustrations are lively and engaging, as you can see below. "Even just the conversation about what makes a person influential would be fascinating, as would a discussion of the problem of how to know historic women deeply when they often did not leave a trail of primary source material for historians to study." Roberts' writing is clear and concise, providing just enough information to pique children's interest. At times, I wish that she had shared more about where she found her information, or perhaps just a few more quotes from the women themselves. But I can understand how this might have weighed down the text too much. It's a delicate balance. Kids who are interested in learning more will definitely be interested in checking out the websites listed in the back. For students who are interested in women's lives during this period, definitely check out the Colonial Williamsburg web site. Kids will like their new article "Martha Washington and 4 great 18th century women you've never heard of." I especially like their profiles of different women who lived and worked in Williamsburg, shedding light on the different roles and activities of a range of social classes. 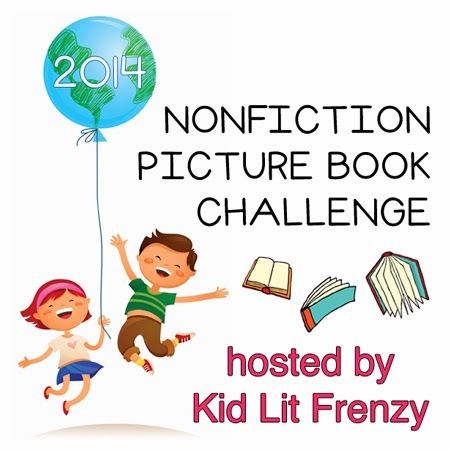 Do you like sharing nonfiction picture books with children? Definitely check out the weekly feature over at Kid Lit Frenzy, hosted by Alyson Beecher. The review copy was kindly sent by the publishers, Harper Collins. If you make a purchase using the Amazon links on this site, a small portion goes to Great Kid Books (at no cost to you!). Thank you for your support. Elementary school kids are interested in exploring the Internet to learn about the world around them. But parents and teachers need to direct kids to finding sites that are interesting, informative and accessible. Kids ages 7-10 are not ready for general searching, but they love exploring what the Web has to offer. Time for Kids celebrates Women's History Month with a dedicated mini-site-- I'd recommend this as a good starting place for 2nd through 5th grades. Kids can easily navigate through different sections, whether they start with modern professionals who might inspire them, background of the holiday, or an in-depth interview with Justice Sandra Day O'Connor. Time For Kids also introduces different historical milestones in Women's History. For example, there's a short article on the suffragist's movement, The Fight to Vote. I like sharing this type of journalistic writing style with kids, getting them primed to read newspaper articles in middle school. 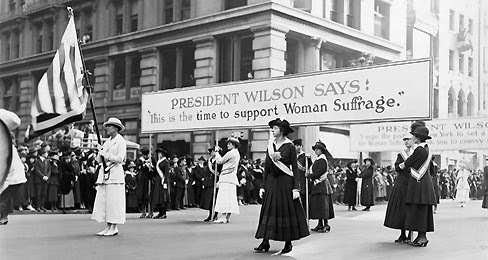 Women suffragists marched in the streets across the nation. I can see using this site to get kids interested in a topic and ready to learn more. Is there a website you like to share with kids to get them engaged and interested in learning more? Do you read aloud much nonfiction with your children? 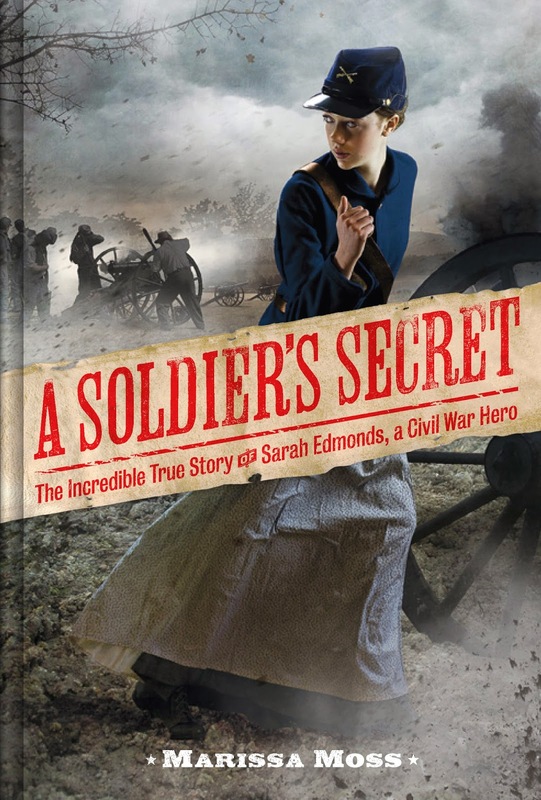 If they're reluctant, try reading them Marissa Moss's terrific picture book biography Nurse, Soldier, Spy -- The Story of Sarah Edmonds, a Civil War Hero. Our students LOVED the way Moss drew them into Sarah's story with unexpected twists and turns. They especially commented on John Hendrix's art and design. At age nineteen, Sarah Edmonds disguised herself as a man and joined the Union Army to fight in the Civil War. She took the name Frank Thompson, and headed off to battle the Confederacy with her Michigan regiment. Frank, as Sarah was known, was an outstanding soldier, brave and true, risking his/her life to help others. My students loved the way Hendrix showed the battle scenes, using both color and dramatic lines to bring readers right into the scene. Hendrix also makes the words pop out from the page with his dramatic design. My students found this particularly effective. I was very interested to learn from Elizabeth Bird's Fuse 8 post in the School Library Journal that "Hendrix takes his hand-drawn letters from the illustrated letterforms found on broadside posters from that era." Historical fiction at its best, this novel by bestselling author Marissa Moss tells the story of Sarah Emma Edmonds, who masqueraded as a man named Frank Thompson during the Civil War. 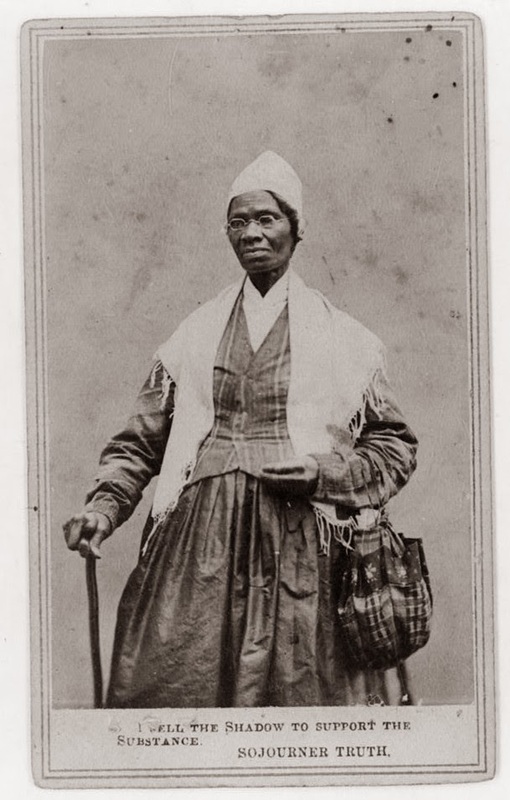 Her adventures include serving as a nurse on the battlefield and spying for the Union Army, and being captured by (and escaping from) the Confederates. The novel is narrated by Sarah, offering readers an in-depth look not only at the Civil War but also at her journey to self-discovery as she grapples with living a lie and falling in love with one of her fellow soldiers. Using historical materials to build the foundation of the story, Moss has crafted a captivating novel for the YA audience. All illustrations are copyright © John Hendrix, 2011; see his website for more terrific examples. The review copy came from our school library. If you make a purchase using the Amazon links on this site, a small portion goes to Great Kid Books (at no cost to you!). Thank you for your support.